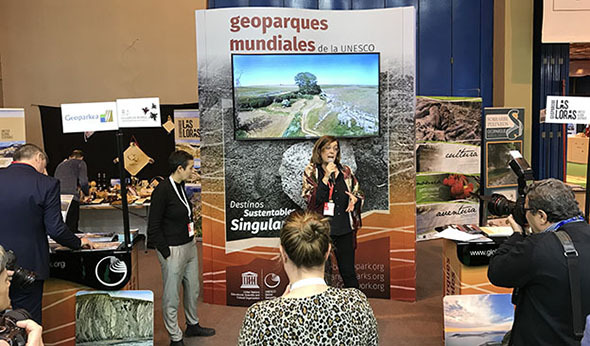 The presence of the Geoparks stand and activities in FITUR 2019, one of the biggest tourism fairs in the world, was very successful and contributed significantly to our common efforts to raise the profile and visibility of the UNESCO Global Geoparks as quality brand in tourism and sustainable tourism destinations! 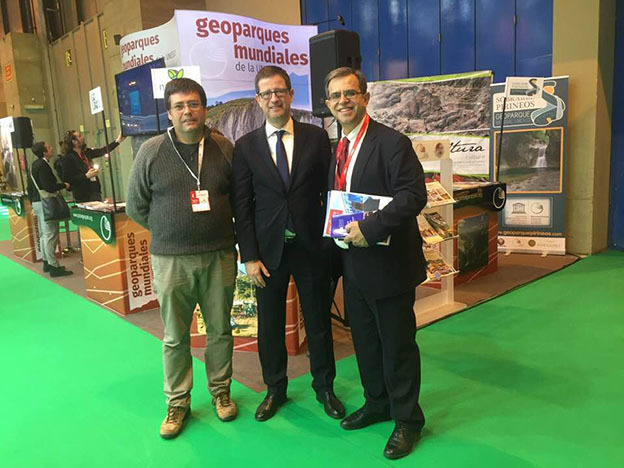 Naturtejo UNESCO Global Geopark in Portugal and Carlos Neto de Carvalho of the GGN Working Group on Tourism, had the coordination of the Geoparks stand in FITUR with the support of the Spanish UNESCO Global Geoparks Forum and its Coordinator Asier Hilario. 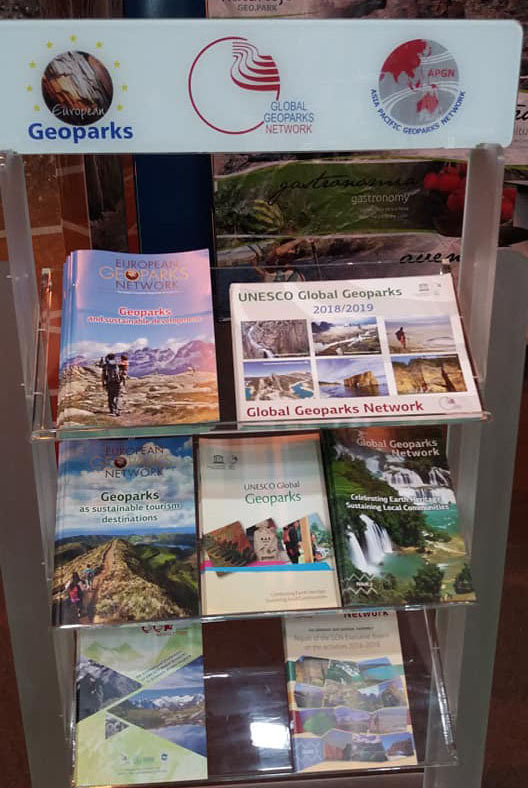 The Geopark Stand was located at the Pavilion 4 – EUROPE, emphasizing the role of the UNESCO Global Geoparks as sustainable tourism destinations in 25 European Countries. 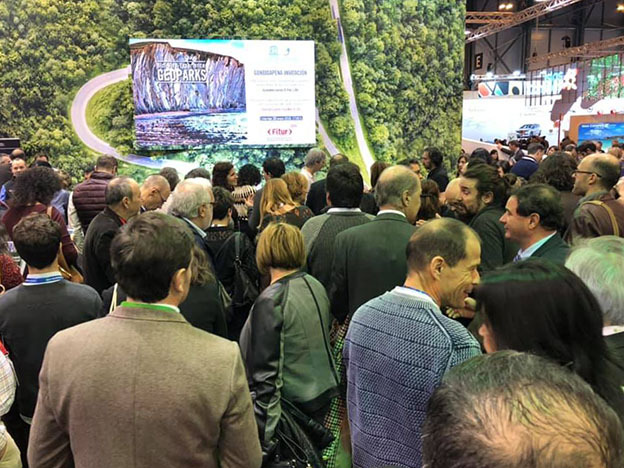 It is important to show through our participation with GGN Stand to the international tourism market stakeholders that GGN represents the global network of cooperation of GEOPARKS, the 21st century sustainable tourism destinations! 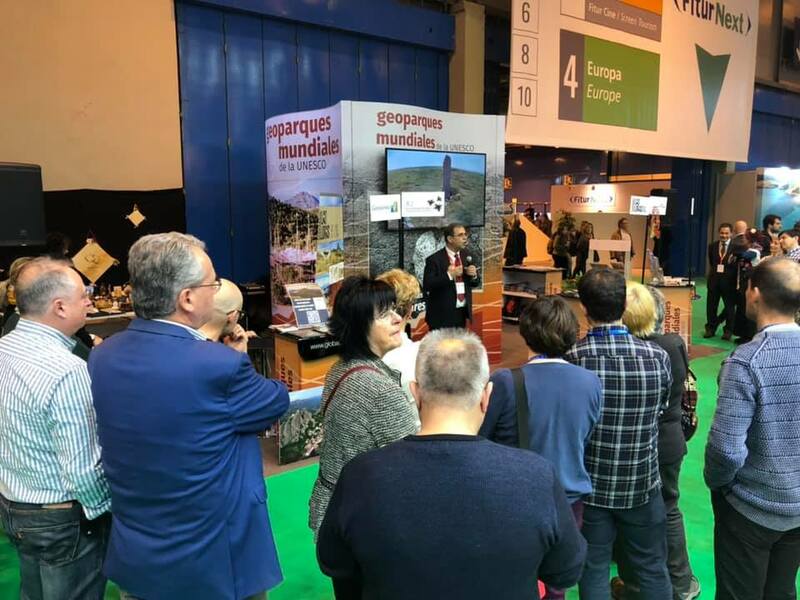 First of all we would like to congratulate our colleagues from Naturtejo, Villuercas Ibores Jara, Basque Coast, Sobrarbe, Central Catalonia, Lanzarote and Las Loras UNESCO Global Geoparks who organized jointly once again the GGN stand in FITUR 2019, contributed to the stand and used the opportunity for their promotion. the General Secretary of Tourism of Portugal Mrs. Ana Mendes Godinho who was welcomed by the President of Naturtejo Geopark Armindo Jacinto and the President of GGN N. Zouros. the General Secretary of Tourism of Greece Mr. Giorgos Tziallas who was welcomed by the President of GGN N. Zouros. the General Secretary of Tourism of Spain Mrs Isabel Oliver met two Spanish delegates and received directly the new book of the Spanish Geoparks. the Director of the sub commission of UNESCO in Dominican Republic which was the invited country this year in FITUR 2019, who expressed great interest on Geoparks. Other Geoparks and aspiring Geoparks were visible through their National and Provincial stands like Azores in the stand of Portugal, Troodos in the stand of Cyprus, as well as some Chinese Geoparks in the Pavilion of China and Mixteca Alta UGGp was represented in the Oaxaca region at the Mexico Pavilion. 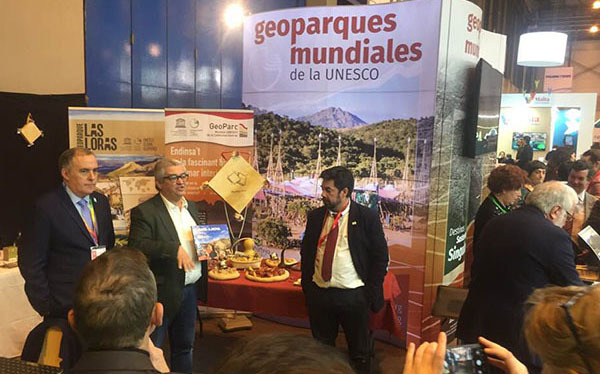 At the opening of the Geoparks Stand which took place the first day of the FITUR 2019, the President of the Global Geoparks Network Prof. N. Zouros presented the Network and its activities to promote UNESCO Global Geoparks as sustainable tourism destinations. He underlined the positive results of the cooperation among Geoparks for the organization of their common presence in big tourism fairs and the impact of their participation in raising their visibility in the tourism market. N. Zouros thanked the authorities of Naturtejo Geopark and the 11 Spanish Geoparks who were present at the event for their work and contribution to the development of Geoparks which are not only tools for the protection and promotion of the geological heritage but also for the sustainable development in each territory and the improvement of the living conditions of the local population. 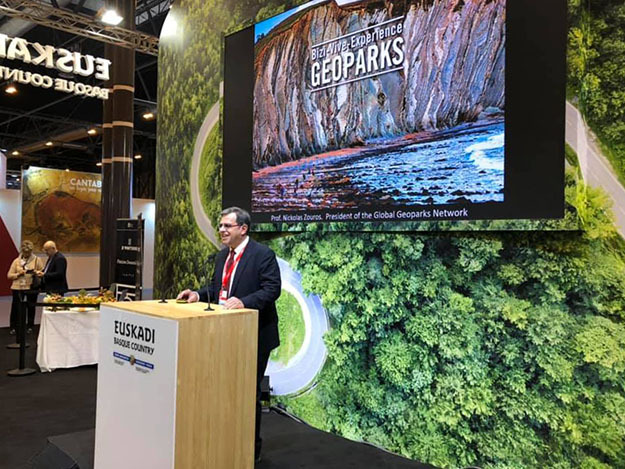 The big event of the Spanish Geoparks was hosted this year by the Basque Government and the Basque Coast UNESCO Global Geopark at the pavilion of Basque Country. The event took place on January 23rd and was dedicated to the presentation of the Spanish UNESCO Global Geoparks Booklet! 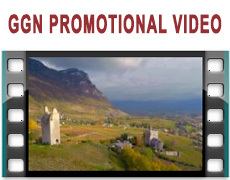 This new publication refers to the presentation of the UNESCO Global Geoparks in Spain and their Geotourism experiences. The event was honoured by the presence of Maider Echeverria García the General Director of Tourism of the Basque Country, Mrs María del Rosario Cordero Martín President of the Deputation of Caceres, Mr Enrique Campo Sanz, President of Comarca of Sobrarbe, Dr. Anchel Garcia Cortes General Secretary of the Spanish National Committee on UNESCO Global Geoparks, the President of Central Catalonia Geopark, delegations from Naturtejo Geopark in Portugal and Mixteca Alta Geopark in Mexico and the representatives of all the Spanish Geoparks (Cabo de Gata – Nijar, Subbeticas, Sobrarbe, Basque Coast, Central Catalunya, Villuercas – Ibores – Yara, Sierra Norte De Sevilla, Molina Alto Tajo, Lanzarote, Las Loras and Tremp – Montsec). The President of the Basque Coast Geopark Oier Korta who underlined the importance of Geoparks as sustainable tourism destinations. The Manager of Basque Coast Geopark, Leire Barriuso, who presented the new Booklet of the Spanish Geoparks. 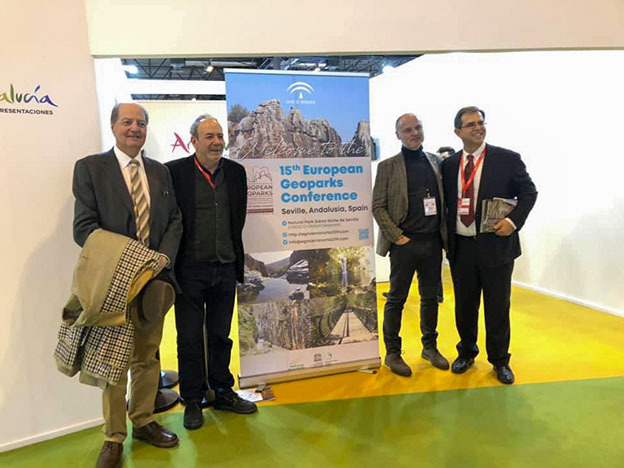 An event for the presentation of the 15th European Geoparks Conference which will take place next September, was held at the pavilion of Andalucia. The General Secretary of the Spanish National Committee on UNESCO Global Geoparks Anchel Garcia Cortes, and the representatives of Naturtejo and all the Spanish Geoparks (Cabo de Gata – Nijar, Subbeticas, Sobrarbe, Basque Coast, Central Catalunya, Villuercas – Ibores – Yara, Sierra Norte De Sevilla, Molina Alto Tajo, Lanzarote, Las Loras and Tremp – Montsec) took part in this event. The Director of the Sierra Norte de Sevilla Geopark Pedro Mendoza who presented the main figures of the Conference. The President of GGN Prof. Nickolas Zouros who presented the importance of the Conference and the activities of the GGN and the EGN for its promotion. The General Secretary of the Spanish National Committee on UNESCO Global Geoparks Anchel Garcia Cortés, who made closing remarks, wishing for the success of the Conference and supported this event on behalf of the National Committee and the Spanish Geological Survey. 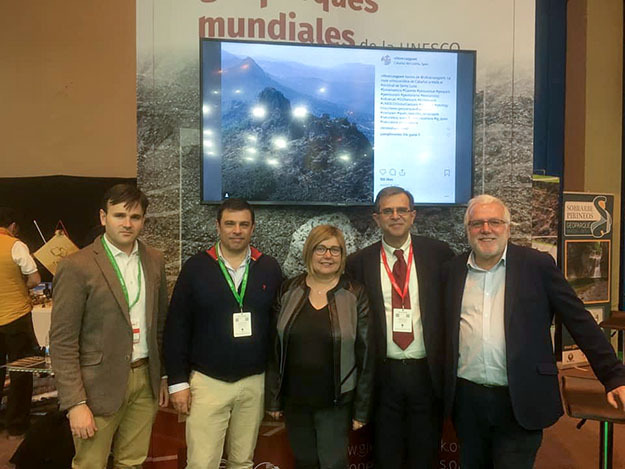 The president of the Provincial Council of Palencia and the Global Geopark of Las Loras, Ángeles Armisén, presented the Geopark las Loras, a natural, tourist and socio-economic resource that is key to the development of the province of Palencia. Las Loras geopark achieved recognition by UNESCO in 2017, an endorsement of the effort and work of many years. Amisén stressed “the solidity of the project and the support of all sectors made it possible to overcome the demanding evaluation that will have to be re-validated in 2021”. It is therefore a long-term project that emerges from bottom to top, in which administrations such as the Diputación de Palencia help and support an initiative that starts from the territory and is for the territory. And it is that the territory in which the Geopark is located has a common characteristic to a large part of the interior Spain, sparse and dispersed population. 2018 has been a year in which projects have been developed for signaling roads and accesses, new pedestrian and cycling routes , such as the successful Calleja route. New informative material and a new guide have been designed and edited. Work has been done in the training of volunteers, entrepreneurs and workers, as well as environmental education projects for schoolchildren, research and conservation. On the other hand, visits to the Cueva de los Franceses, managed by the Provincial Council of Palencia, increased by 16% (22,706). 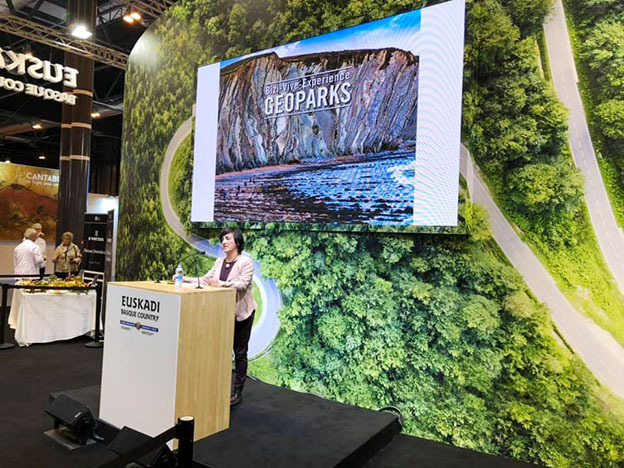 Several other events for the presentation of Geoparks took place during FITUR 2019. Sobrarbe Geopark presentation of natural resources, infrastructure and tourism activities took place in Aragon Pavilion. Naturtejo Geopark presentation of tourist offer and gastronomy took place at the Geopark stand by the President of the Geopark and Mayor of Idanha-a-Nova, Armindo Jacinto. Villuercas – Ibores – Yara Geopark new publication presentation by the Mrs María del Rosario Cordero Martín President of the Government of Caceres and Jose Maria Barrera, Manager of the Geopark. The GGN stand at ITB (Hall 4.1b Adventure Travel – Responsible Tourism) will present the new UNESCO Global Geoparks label as well as the UNESCO Global Geoparks as innovative sustainable tourism destinations and the activities of the Global Geopark Networks to promote Geoparks – GGN, APGN, EGN and LACGN! Some of our colleagues are going to participate in the 14th Pow-Wow for Tourism Professionals talks whose subject is “Scenic Roads and Trails – Cherishing Earth’s natural and cultural landscapes”. Registration in this event needs prompt action from you because of the expired deadline. Please find the registration form for the 14th Pow-Wow attached and contact Carlos Neto de Carvalho for assist you. This year many UNESCO Global Geoparks will participate in the common effort to present Geoparks as sustainable tourism destinations. Is there any Geopark willing to participate in ITB that is not in this list? Please send the registration form & information doc circulated few months ago with your data so we can prepare the GGN presence in ITB. In order to get better visibility of the Geoparks tourist offer we propose to create for ITB 2019 an electronic and paper catalogue of some of the most attractive activities/experiences in UNESCO Global Geoparks. Please help us providing the best example from your Geopark by filling the template below until 12th February! GEOmuseums: itineraries within the geological and cultural heritage of the Nordic Countries.